Technically Computex 2011 doesn’t start for another day, but already companies are announcing new hardware right ahead of the event in order to try to beat the rush. NVIDIA is one of those companies; at Computex they’re announcing their new wired 3D Vision glasses. As a bit of background, since the introduction of 3D Vision in 2009 the hardware has remained relatively unchanged. NVIDIA launched with their wireless 3D Vision glasses kit at $199; more recently they dropped the price down to $149, but other than a slightly tweaked revision of the glasses offering double the battery life, the glasses themselves haven’t changed. Meanwhile, though wireless glasses are generally going to be the best way to use an active shutter 3D system, it does have a couple of downfalls: there’s only so much cost cutting that can be done, the need to have batteries and USB connectors on-board dictates design to some degree, and $150 objects that are not tied down tend to grow legs and walk away. As the market for 3D Vision expands, driven by declining prices for the necessary 120Hz LCD monitors, NVIDIA has finally had to deal with these problems, both to keep costs in-line with cheaper monitors and to build a set of glasses suitable for some new markets. The result is that we’ve come full-circle: 3D shutter glasses are now wired once again. Being announced today and shipping in late June are the NVIDIA 3D Vision wired glasses, which NVIDIA intends to fill the above niche. 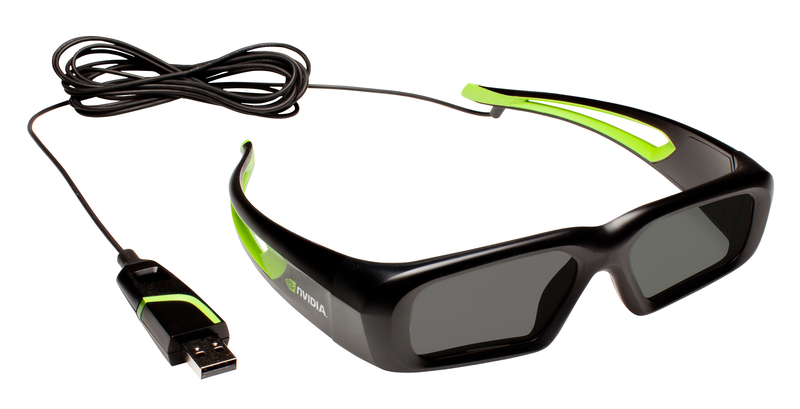 As the name implies, it’s a set of 3D vision glasses that are wired – in this case using USB 2.0 – instead of the wireless glasses + hub solution that NVIDIA’s wireless kit uses. By ditching the batteries and the IR gear, and by integrating the functions of the 3D Vision hub into the USB connector itself, NVIDIA has been able to cut production costs. Priced at $99, these are intended to be the new low-end glasses to go with the aforementioned cheaper 120Hz monitors, while the wireless glasses will continue to be offered at $149. Besides the fact that the wireless glasses are wireless, it looks like the other features differentiating the two will be the 3D Vision control functionality the wireless hub offers - convergence controls and turning 3D Vision on & off - as there's no analog on the wired glasses. The wired glasses will also be serving as NVIDIA’s first official foray into LAN/cyber-café business. As wireless glasses can’t be easily secured and can be easily stolen, NVIDIA designed and will be pitching the wired glasses as a practical alternative to café owners that want to offer 3D Vision without their investments walking out the door. The wired glasses feature a Kensington lock slot in the USB connector/hub, which means the glasses can be locked down like the rest of a café’s hardware. We wouldn’t venture to guess just how many cafes are actually interested in offering 3D Vision right now, but clearly NVIDIA believes it’s a worthwhile market to chance. Finally, in spite of the wired nature of the glasses, they may end up being more comfortable than the existing wireless glasses. NVIDIA isn’t heavily promoting it, but the wired glasses do have a different fit thanks to the fact that there’s no longer a need to embed batteries, IR receivers, or a controller into the glasses themselves. Of the few different editors here at AnandTech that have used the wireless 3D Vision glasses, the most common complaint is the fit; as the glasses are one size fits all, we’ve found that the glasses pinch our (apparently) big heads. Although only NVIDIA really has any data to back up how many users shy away from 3D Vision due to the fit of the glasses, we suspect we’re not the only ones that the existing glasses poorly fit – the merits of the technology mean little if the glasses themselves can’t be worn comfortably for any length of time. Once we receive our sample glasses we’ll be taking a look at the fit to see if these are any better than the wireless glasses. Wrapping things up, the wired glasses will cost $99 and be shipping in late June from NVIDIA and other retailers. NVIDIA hasn’t talked about any long-term plans for the wired glasses, but we wouldn’t rule out the possibility that they’re going to replace the wireless glasses in monitor bundles that already include glasses. A few manufacturers are building the IR transmitter directly into the monitor’s bezel these days, but for the rest this would be another way to bring down the price of a complete 3D Vision kit. They should research other things instead of useless 3d-technology that won't become mainstream anyways. 3d simply doens't look that good and is very much overhyped. I think 3D has its place. Not necessarily on TV's but in projectors and possibly phones (have to see how that pans out). Having said that if I had a 3D camera and/or camcorder then a 3D TV would be fantastic. I'm waiting for projectors using polarisation to be released and become affordable. Then you can have ultra-light cheap glasses, and unlike TV's that use polarisation there's no loss of resolution. don't have to worry about having more than one pair of glasses, way more media that supports it. Yikes! There are some things you DON'T want coming out of the screen at you! I bought a 3D kit years ago that's very similar to what Nvidia are selling now. It worked well except for the ghosting and the fact my monitor could only go to 75Hz. "Besides the fact that the wireless glasses are wireless, it looks like the other features differentiating the two will be the 3D Vision control functionality the wireless hub offers - convergence controls and turning 3D Vision on & off - as there's no analog on the wired glasses." Just to clarify, are you saying that only the hardware does not have these features any more, or the software as well? As both of the things you listed can be changed via the 3D Vision drivers, it is just that you won't have any hardware buttons on the glasses to get the same effect as they were both on the IR beamer, unless I am missing something.